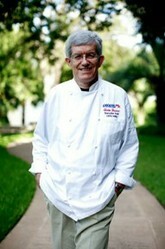 Healthy Chef Recipes is a new blog by Alain Braux , a French chef in Austin, TX. Learn how to lower cholesterol with easy French recipes. Lowering cholesterol with French cuisine? Alain wants to teach us how to eat fresh, delicious food...and lower our cholesterol along the way. "For more than thirty years, the major trend in French cooking has been the Nouvelle Cuisine, created by a group of young and revolutionary chefs in the 1970’s. The term was coined by the food critics Henri Gault and Christian Millaut to describe a trend started by Chef Fernand Point and his pupils and followers, a group that includes Michel Guerard, Roger Verge, Paul Bocuse, Alain Chapel and the pâtissier Gaston Lenotre. "Their tenet was (and still is) that good food should not be loaded with dairy products or heavy sauces. "Good food should stand on its own by the quality and utmost freshness of its ingredients. "The Nouvelle Cuisine was lightly cooked, using the freshest meat, fowl, produce and fruits available locally, and harvested only in season. The sauces were light, colorful and tasteful. The plate presentation was art in itself, colorful and well balanced. The serving plates were carefully chosen to be the canvas on which the food was presented. "I was fortunate to have the opportunity to work in this environment when I worked for Roger Verge at the Moulin de Mougins - his famous restaurant in the South of France, and for Gaston Lenotre in Paris and Houston." You may or may not have heard of the "Lyon Diet Heart Study" (1988-1992), where heart attack patients were split in two groups. One group received the regular advice of watching their cholesterol intake, consuming less saturated fats, and taking prescription meds. The other group was put on a Mediterranean Diet. After 4 years, all patients were told to eat Mediterranean foods. Interestingly enough, the second group had experienced a 45% reduction in their risk of having another heart attack. No statin drugs, no difficult restrictions - only good food! When Chef Braux suffered from unhealthy cholesterol levels--after a stressful period of teaching and running his business--he put himself to a year-long test, documenting his eating habits and recipes, as well as his progress with lowering cholesterol. It's an amazing story! Luckily for us, the good Chef has collected his stories and chef recipes in 3 books (so far). And now he has even started his own blog, where he will share all his knowledge with us...on healthy living and delicious French cooking. Go on, say hello to Chef Alain Braux and easy healthy recipes! Quick - do you know your cholesterol levels? Sorry, but I'm not a joiner. We just got a new septic system. Should be ok.
After 2 heart attacks and a mini stroke, last year, the old ticker is working just fine. Cholera exists only in Africa. I can't believe it's butter! I trust only Bubba's chef recipes. BBQ saves my life! Have you checked out Alain's healthy Chef Recipes? Whatcha think? chefkeem, Thank you for the backstories and products. I'm amused by the message I got by accidentally registering "350 and counting" instead of "I can't believe it's butter": "You still alive??!" It's lovely the way those dairy products don't have to be missed since calcium occurs in almonds, beans, leafy greens and lentils, all of which lend themselves to chef-type recipes. I will order one of his books tonight! Thank you for this article! I have! I have the frugal cookbook. It is actually hard to find cookbooks that have recipes with whole ingredients and real food (instead of a packet of this and a box of that). Chef Alain uses the traditional approach of using economical, in season foods to cook. The chef recipes are fantastic and the blog has a stunning design. I'll have to try out some of these healthy recipes in my holiday break. I like the fact that Alain Braux took to heart (no pun intended) his doctor's advice about the adverse effects of cholesterol. If only other high profile chefs would take a leaf out of his book and provide healthy recipes also - it might go a long way to overcoming the obesity plague worldwide. I was born in Europe, so I am familiar with Mediterranean cuisine. I think it is very healthy... I still keep some cooking ideas from old Europe, like using olive oil... eating a lot of salads and fruits. I don't know enough about the New French Cuisine, you give me good info, so I will research a little and try some.